Last year SAHPA requested examples, especially certificates, of a little known and short-lived Salvation Army Award presented for bravery to members of the Life-Saving Scouts and Guards. We were delighted to receive the following concerning one brave Salvation Army Scout from Guildford. Henry James Hall was born on 26th September 1907 in Guildford, Surrey. He was the fourth of five children, the others all being girls. In 1918 Henry, apparently always regarded as being very active, joined the Guildford Troop of the Life Saving Scouts. Whilst playing near home one day in early 1919, he became aware of a boy who was swimming in the River Wey at Stoughton (a mile or so from the centre of Guildford) in danger of drowning. James jumped into the water and with some difficult, got the drowning boy to land, after which James promptly fainted with exhaustion. 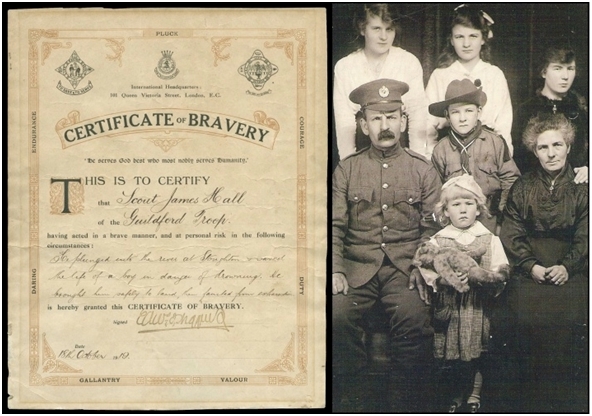 Pictured below is James’ certificate and a picture of his family. These have been identified as (back row) Doris, Winifred and Ellen, (middle row) Henry James Snr, Henry James Jnr, Ellen Mary (front) Irene (with her teddy Aloysius)!